They did well for the time. I mean in early 2009 we hardly had social media and only the rich had the first version of an iPhone. Also no multi-channels. I don’t understand your point. News has been covered for decades before social media and smarts phones came along. I’d go as far to say if people relied on social media - then or now - the outcome would be even more disastrous. 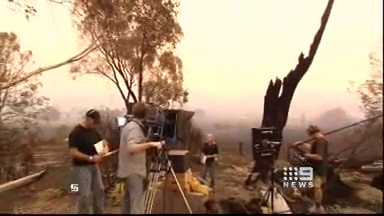 Ten years after the devastating Victorian bushfires, broadcasters, journalists and a cameraman share their experience of reporting on the disaster. I should point out, this is more than just Faine. Producers, cameramen and reporters all included. Partial bulletin uploaded by Nine. I will never forget this day and night. I live on the outskirts of melbourne and remember seeing one of the fire in the horizon moving with thick black smoke and worried then went down to mornington peninsula for dinner and to drive back wondering how I am going to get back home because there was fires nearby and the road was blocked and then to listen to 3LO at 10pm for the police news conference and driving with tears down my eyes when they said 14 people killed. 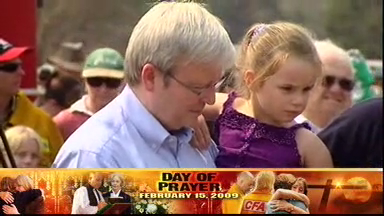 My family went thru Ash Wednesday but nothing compares to that day and the numbness I felt for the following few days. I’ve got some bulletins from the 9th to the 15th of Feb (mostly partial) on an old DVD my friend gave me years ago and just found it the other day. Should be uploaded on Archive.org. Rare find. 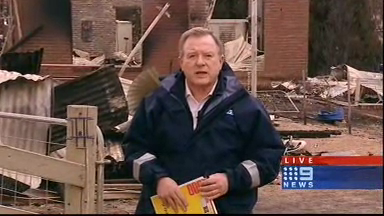 Nine News Melbourne - Black Saturday Bushfires Openers (Feb 7 2009-Feb 15 2009). Missing 12th of feb opener. Might upload in better quality since it wasn’t working before. Seven really did out do Nine that night, but provided good coverage the days after. I don’t suppose the actual audio log of the broadcast that day is available?